Looking for news about the Lyle Hess Cutter project? 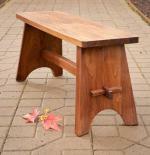 I had chance to build this cherry dining table from the clients design. I was happy how it came out. 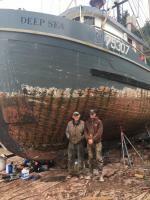 Thatcher hauled his troller Deep Sea in Hoonah, Alaska this spring and I went up to work on her for a week or so. I am on the Lopez Island Studio Tour September 2 and3. I will be showing furniture I have made, but of course you can still look at the Lyle Hess Cutter. . . .